If you’re a big fan of slot games from Net Entertainment then you’ll be happy to know that the gaming software developer has a brand new title for you to try out. It has a really exciting name, Jungle Spirit: Call of the Wild slot, and our first look at the game indicates that it is everything that the name promises! The theme of Jungle Spirit: Call of the Wild is fairly easy to guess, and indeed the overall look of the game is really majestic since it resembles a busy tropical jungle populated with fierce animals and gorgeous flowers. There is no doubt that the state of the art graphics help makes this one of the best looking games around. The game’s sound track is also really good and is interspersed with snake hissing and tiger roars; it will keep you entertained while you try your luck at winning a bit of money. This game is playable on all devices, especially smart phones since its software is compatible with many different operating systems. In fact, it plays very well on smaller devices. Jungle Spirit: Call of the Wild has 5 reels as well as 243 ways to win. The game can be played for as little as 20p a spin but the maximum permitted wager is £100. This is an ‘all pay’ slot game because matching symbols will have a payout whenever they land on adjacent reels and irrespective of their positions. What this means is that you will have plenty of small wins when you play this game. The game’s symbol expansion feature can increase the number of wins dramatically. Thanks to this feature, any symbol that is part of a win will multiply to cover the entire reel. The game has a special feature known as Butterfly Boost and it really adds a great deal of excitement to the game. The screen has a number of glittering butterflies, but once in a while, they land on symbols (up to a maximum of three of them), getting the symbols to cover the entire reel. There are major prizes to be won here depending on the symbol they land on. This game also has a free spins bonus round. It is launched when at least three scatter symbols land on any position of the reels. You’ll have to choose one out of the five available options of Free Spins Animals. Each option comes with a combination of free spins and coins, with the tiger giving the least free spins (4) and the maximum coins (150). The cobra gives the maximum free spins (20) but the least coins (60). This bonus round dramatically increases the chance of a win. 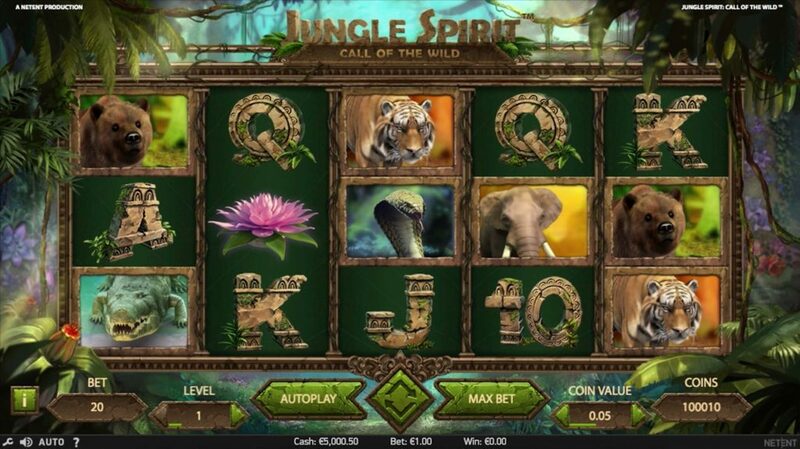 Why We Recommend Jungle Spirit: Call of the Wild Slot? 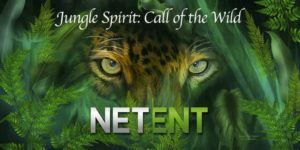 Jungle Spirit: Call of the Wild has a payout percentage at 96.4%, and this is pretty standard for NetEnt games. In fact, this is another reason why games from this developer are so popular with gamblers everywhere. You can easily find this game at a number of gaming sites powered by NetEnt. Be sure to pick one that offers excellent bonuses in addition to a reliable gaming environment.